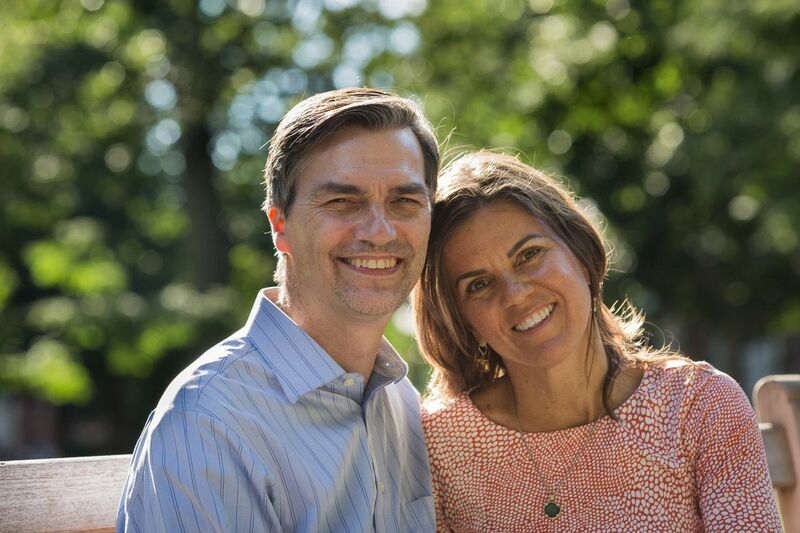 Positive-psychology experts James Pawelski and Suzie Pileggi Pawelski. The theme is straightforward in James Pawelski and Suzann Pileggi Pawelski’s new book, Happy Together — Using the Science of Positive Psychology to Build Love That Lasts: “Love the good in your partner. … Support your partner in the continued development in that good. … Work to become a better person yourself,” they write on Page 224. James is a professor and researcher at the University of Pennsylvania’s Positive Psychology Center, where Suzann, a writer, got her master’s degree. Scientific research and relational philosophy are the pillars of positive psychology, a field that studies the strengths that enable individuals and communities to thrive. Married with a child, the Pileggi Pawelskis understand that their hypothesis is more easily proposed than pulled off. They hope their book will help others improve their own intimate relationships, and are traveling the world to share its messages. They also do their best to live it themselves. How is your book different from other advice books about love and relationships? Suzann: It’s the first book of its kind that uses the science of positive psychology. There are tons of relationship books. … Ours is focused on science and on what’s already going well in relationships. How does positive psychology work in romance? James: It makes a precise acknowledgement that the myths that are out there about relationships — in fairy tales, in popular media — are not terribly helpful. They’re not realistic. The good news is, [positive psychology] is not escaping from reality: It’s escaping to reality. It’s seeing that underneath the fairy tales and the dark, depressing headlines, there really is good stuff. But it’s not easy. It’s not simplistic. … “Happily ever after” is where a relationship starts. So, Disney movie endings aren’t realistic? Suzann: Romantic relationships … take skills and practice. If you want to excel at your job, you work hard. If you want to be physically fit, you work out. For some reason, people think if you have to work at a relationship, it’s just not right. What’s the philosophy behind lasting romance? James: Aristotle says there are three different things that [people] love. We love what is useful, we love what is pleasurable, and we love what is good. In relationships, those elements make a lot of sense. We have study buddies or business partners for useful relationships. Hopefully, we have friends who are just a lot of fun to hang out with. But if our marriages or our long-term friendships or relationships are built around usefulness, well, that was probably OK 100 years ago. If they’re built around pleasure, people run out of steam. When you see the good in the other person’s character, that inspires you to want to support them — and to want to be a better person yourself. Suzann: The first thing is, identify what your own strengths are. I’m going to sound like a philosopher: “Know thyself.” Knowing yourself and knowing the strengths of your partner will show you how you can work together. Once you know your strengths, you ask yourself, how much is the person I’m with invested in growing and becoming better? A lot of people are just like, well, this is the way I am. How do you know it’s a good fit? Suzann: You’re looking for somebody who inspires you. How can he or she complement me, not complete me? Should you seek out someone with your same strengths, or do opposites attract? Suzann: Although there are often frictions with differences, you can also see differences in your partner and appreciate them instead of seeing them as a deficit. James: Think about it as a team. Imagine a soccer team in which everyone’s a goalie, or a baseball team in which they’re all catchers. One of the great things about a team is that you’ve got a goalie and a striker; you’ve got defenders. Sometimes they may not really understand each other, but when they work together as a team, that’s when the effort is worth it. What keeps a relationship strong? Suzann: Gratitude is one of the most important things for well-being and for relationships. People who are grateful and who are ready to receive gratitude create an upward spiral of blessings. And then, savoring. We’re all running so quickly throughout life. We can let moments pass by us. Research shows it’s the moments — when you connect or you don’t connect — that matter. James: Our tendency is to think about what went wrong and how we can fix it. But you can learn just as much from reflecting on what went well and how to turn up the volume. Any more everyday relationship advice? Suzann: Research shows, if you help facilitate strengths in your partner, it leads to better overall satisfaction — and better sexual connection as well. In the book, we talked about strength conversations and strength dates. For a strengths date, you choose one of your top strengths and one of your partner’s. James and I did this recently. I chose zest, and James chose love of learning. We asked ourselves, what could we do in the city where my sense of adventure and James’ love of learning would be piqued? We decided to ride Segways on a historical tour. So, it’s work, but it’s fun, too. James: Yes. I could — we could — talk about it all day.